My family moved from New York to the Cherry Knolls neighborhood the day before my first birthday, in 1976, before Centennial existed. My parents still live in the same home they bought over 40 years ago. Having grown up here, and after starting my own family with my wife, Jennifer Steller (whom I met at a high school track meet), I couldn’t imagine raising my kids anywhere else. In 2005, with our first child born, my wife and I moved back to Centennial and now live only seven houses away from the home I grew up in. We now have five children and love the city and our neighborhood. The safety of the community. We love that our kids can play outside and bike around with their friends. We love the biking, running trails, the creeks and pond, and the parks. The location is ideal: Everything we need is nearby for shopping, kids’ activities and entertainment, and we can easily head downtown for shows and special events or get into the foothills fairly quickly. 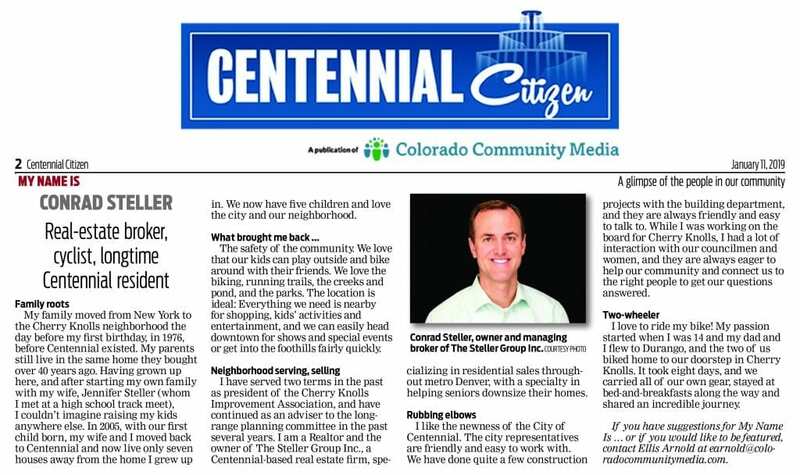 I have served two terms in the past as president of the Cherry Knolls Improvement Association, and have continued as an adviser to the long-range planning committee in the past several years. I am a Realtor and the owner of The Steller Group Inc., a Centennial-based real estate firm, specializing in residential sales throughout metro Denver, with a specialty in helping seniors downsize their homes. I like the newness of the City of Centennial. The city representatives are friendly and easy to work with. We have done quite a few construction projects with the building department, and they are always friendly and easy to talk to. While I was working on the board for Cherry Knolls, I had a lot of interaction with our councilmen and women, and they are always eager to help our community and connect us to the right people to get our questions answered. I love to ride my bike! My passion started when I was 14 and my dad and I flew to Durango, and the two of us biked home to our doorstep in Cherry Knolls. It took eight days, and we carried all of our own gear, stayed at bed-and-breakfasts along the way and shared an incredible journey. To read the original article in the Centennial Citizen, click here.